In the first of our 'vendor series' reviews, we take a look at Kentico CMS. Named a 'Challenger' in the 2018 Gartner Magic Quadrant for web content management. Originating from Brno, Czech Republic, Kentico V1 was release back in June of 2004 with its aim to become the most affordable CMS for ASP.NET for professionals. It’s continued to grow over the years to its current version 12 where it has introduced its new MVC architecture and set the development plans for the future. 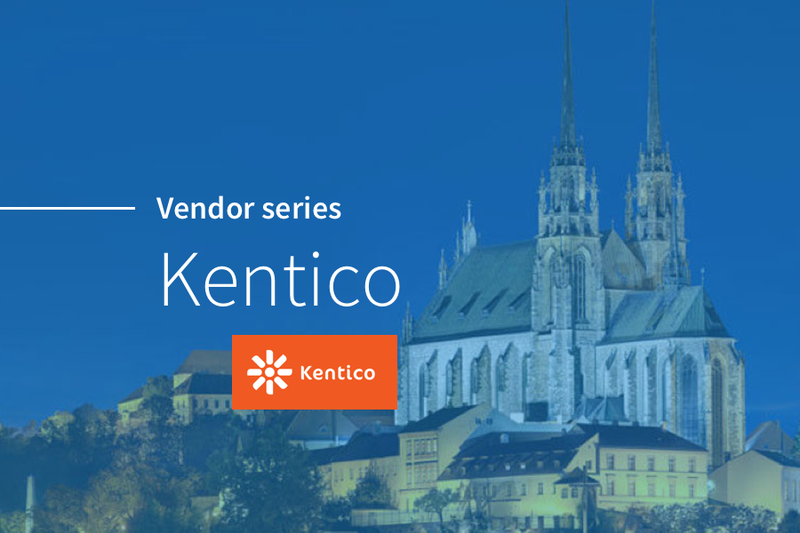 Kentico prides itself on being a fully integrated ASP.net, e-commerce and marketing suite. Kentico is one of very few all-encompassing CMS, Ecommerce and Marketing platforms. Since the beginning, its all been developed in house and one system which has the benefits for companies of not having to upskill with multiple, various disparate systems. In recent years it has been opening up more to allow the inclusion of 3rd party systems system as UCommerce. Kentico has a semi active market place where community members can share modules and webparts a like with some being free and others charged at a fee. While the platform itself isn’t open source, there are various open source tools such as KInspector which offer some great benefits. Offering a multitude of ‘out of the box’ features, Kentico’s platform can hold its own on small information sites to fully blown e-commerce sites with complex marketing implementation. Kentico offers a clean and simple installation process. Select a few basic options and you’re up and running in under 10 mins. The installer allows you to select from a few different templates, one notably being called ‘Dancing Goat’ which show cases some of the basic principles and gives you a good starting point in learning how the platform works. Out of the box, Kentico CMS is easy to pick up and use. If you’ve used a CMS before, a lot of the same principles will apply, creating page types, applying templates etc. A non-technical person is able to create basic sites, set up product stores and implement marketing functions with relative ease. Things can get more complex when you want to develop custom functionality, but if you know your .Net, you’ll get on just fine. Of course, there are some nuances you come across but with a decent support service, you quickly find a resolution for 90% of your issues. One of the main features to Kentico is that it has an fully integrated marketing solution (Kentico EMS) that can be added onto the licence you have to give a full suite of marketing tools that would cost thousands a year in additional 3rd party licence costs. Kentico CMS can cover a multitude of sites, in fact there aren’t many that wouldn’t suit Kentico. It can be over kill for a small information site and with a base licence starting at £3,599 it can be too costly for a start up or small company. Its huge array of ‘out of the box’ features is a great selling point, but again, for the smaller sites – not always necessary. Its suited to big enterprise sites and can handle multiple servers and load balanced sites and with its full feature set, can cover all ecommerce and marketing needs for a growing site. It’s up there with the biggest and best and has recently been named in the Gartner Magic Quadrant. As mentioned above, Kentico have recently released version 12 which is its first ‘full’ jump into the world of MVC. They plan to continually grow this direction and eventually retire the old ‘portal engine’ approach. Their road map shows plans to migrate to .NET Core keeping their tech stack up to date and relevant to developers. Along side the above, Kentico are also evolving their other offering; Kentico Cloud – a headless CMS. I’ll talk about this in a future post in this series. Go to https://www.kentico.com for more information or alternative, drop us a line to see if Kentico is right for you.